I have quite a bit of experience cultivating "inedible" mushrooms but have never grown anything that would taste nice in an omelette. 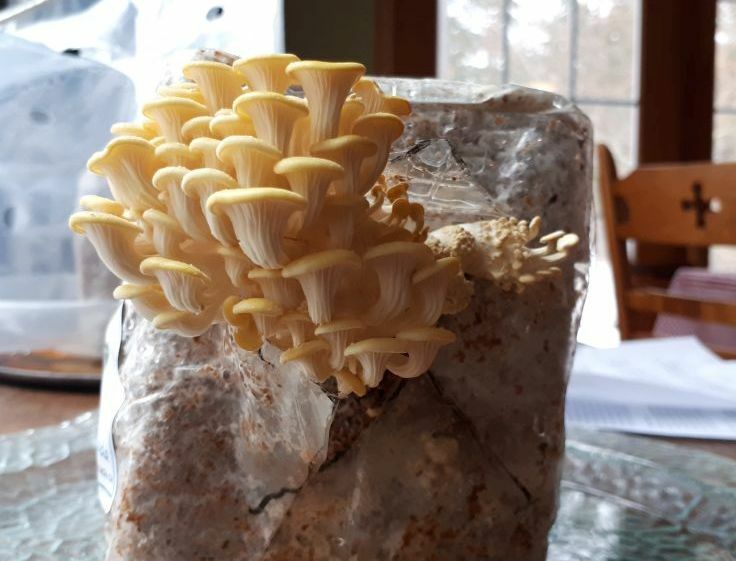 Recently, I bought some petri dishes from a Canadian supplier, and impulsively added a couple of their grow kits to my order: Lion's Mane, and Yellow Oyster. According to the instructions, I'm now supposed to cut a couple of x-shaped slits in the bag, then keep them nice and humid until mushrooms pop out. However, while I see lots of mycelium, there are also big areas of uncolonized sawdust on the surface. 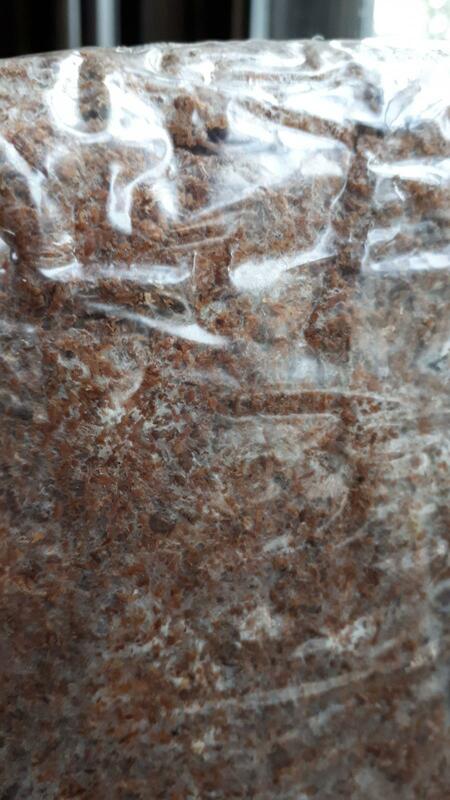 Should I wait until the mycelium has completely covered the sawdust block? I mean, I wouldn't open a jar of grain spawn, or birth a BRF cake, until every bit of the grain was nice and white. But maybe the procedure is different, here? Are these really good to go, already? Thanks! They had a long journey, then sat on my deck in -5 C for an unknown period of time (they didn't freeze, as far as I could tell). I'll wait a while before cutting open the bag, then. So, I waited a while, then made the cuts. A couple of weeks on, it looks like a bunch of expanding foam insulation is bulging out the sides of the bag. So, this glop will differentiate into mushrooms at some point? I guess I'll find out. Did you perhaps get the blocks mixed up? 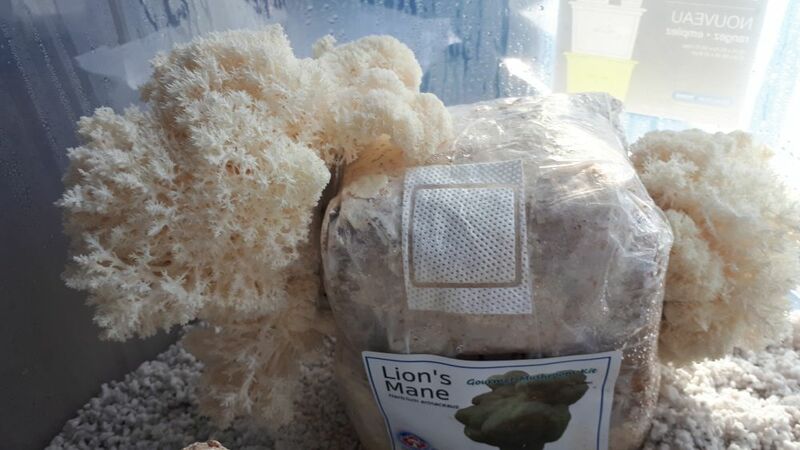 That looks more like Lion's mane than Oysters. If so the blobs will most likely just get bigger. Seems to be OK. 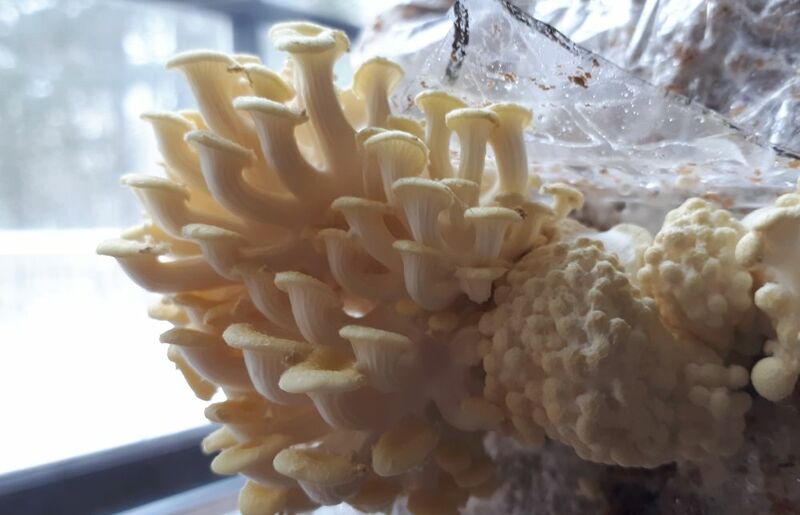 Since late morning, when I posted, the blobs have separated into miniscule oysters! I'm really enjoying the show. I guess I should remember to take some spore prints, when they grow out. Nope those are definitely oysters. They love lots of oxygen or they sometimes can look weird. I has some that the caps all of the sudden started growing other mushrooms from them and looking like sea anemones. Still tasted good, just odd. Did it say to make a cut that big? I would have made smaller X's so they would cluster smaller and more evenly. About an inch across in multiple even spots over the bag. They look good btw. Yup, the supplier was really specific: a 4" long X, on each side of the bag. The instructions for the Lion's Mane specified smaller slits. Jackolantern, looking again at the instruction sheet I downloaded, the specifications given are actually for regular oysters, Pleurotus ostreatus. 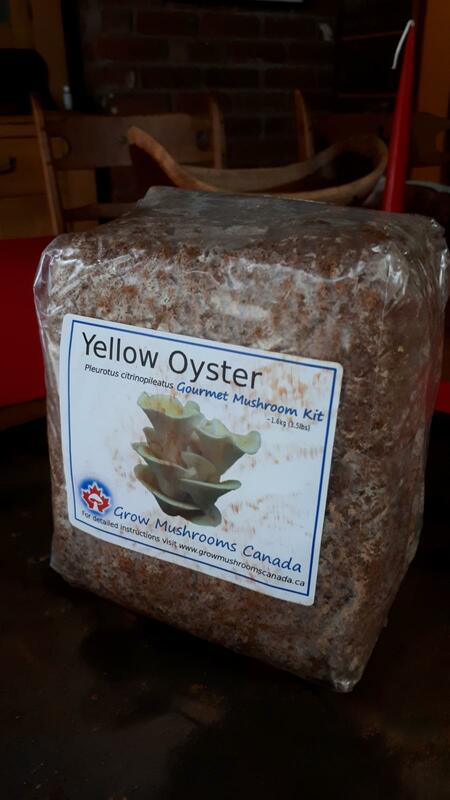 The company didn't provide specific information for their Yellow Oysters. Maybe a smaller X would have been better. The mushrooms themselves are shapely, but quite small. I wonder if they'll expand? Interesting to watch these things. A day later, they're a bit bigger and prettier. And extremely fragrant! We had the yellow oysters for supper, last night. Wow, what a tasty mushroom! Better than the chanterelles & Craterellus I pick wild. Makes me want to grow my own on a larger scale, one of these days. 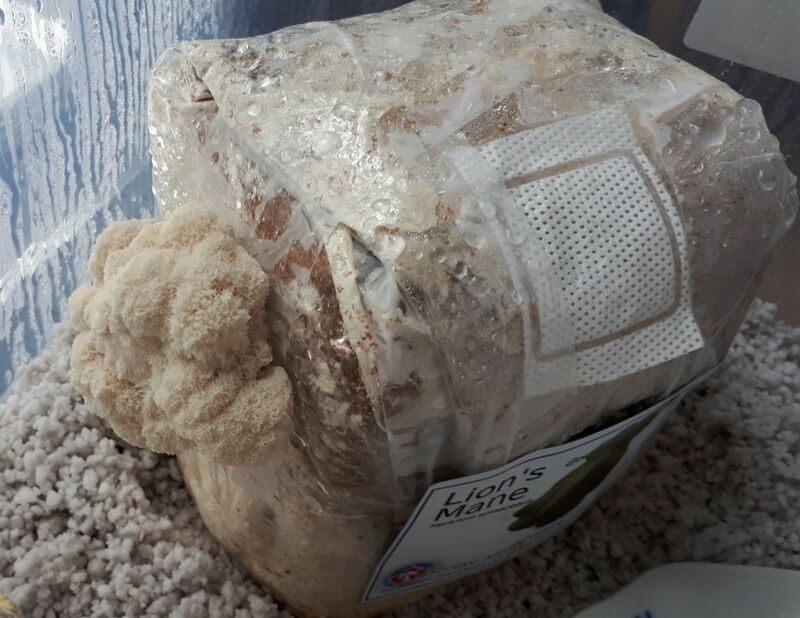 The Lion's Mane was doing poorly in the plastic tent the kit-makers provided, so I moved them to a tub. They responded enthusiastically to the improved humidity, and are starting to look distinctly leonine. Edited by WalkingCatfish, 15 January 2019 - 03:33 PM. A week later, they're bigger and shaggier, and seem healthy. They still don't look droopy and saggy, like the ones in the pictures. 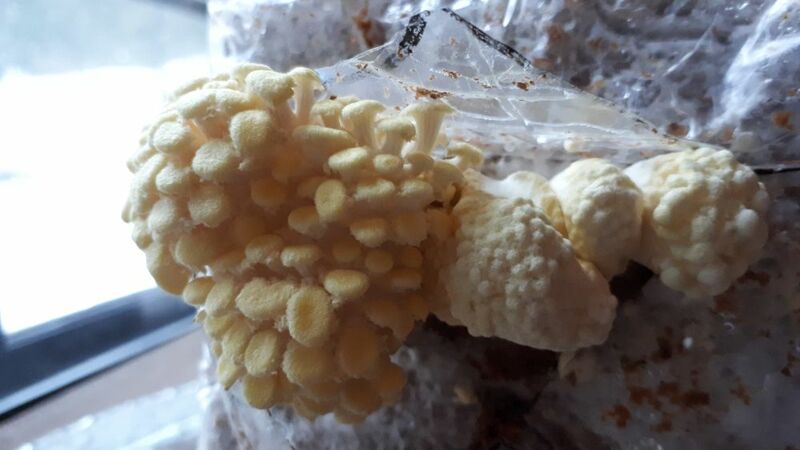 So, the masses keep on growing, on both sides of the mycelium block, but show no sign of drooping downward, producing the pendulous lobes I've seen in pictures of Hericium erinaceus. Instead, they're all branchy and lacy, like broccoli gone to seed. Or like coral, maybe. Could the company have sent me H. coralloides, instead? Or is this thing going to change its shape soon? 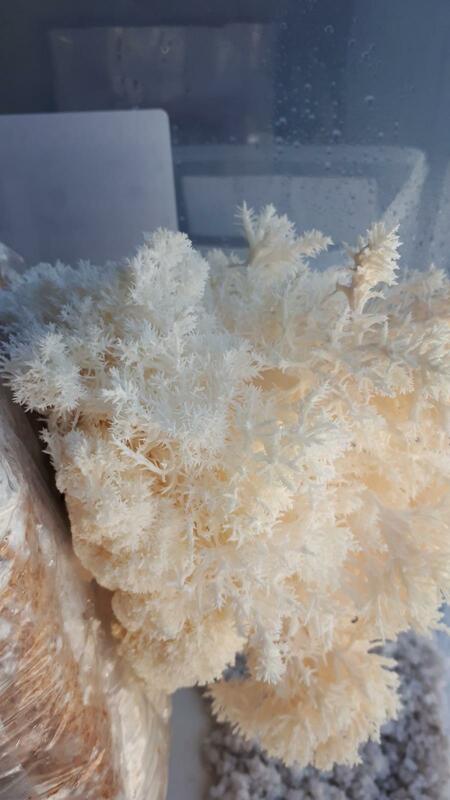 I will get the same coral-like structures on my Lions Mane when in high humidity like in a FC. Outdoors or even indoors let's say on the kitchen counter, I always get the broccoli/cauliflower looking heads. I suspect it's environmental, but I have never gotten them to grow with that hairy droopy look as observed in nature. On the second flush, I'll drop the humidity and give it more air, and see what that does. 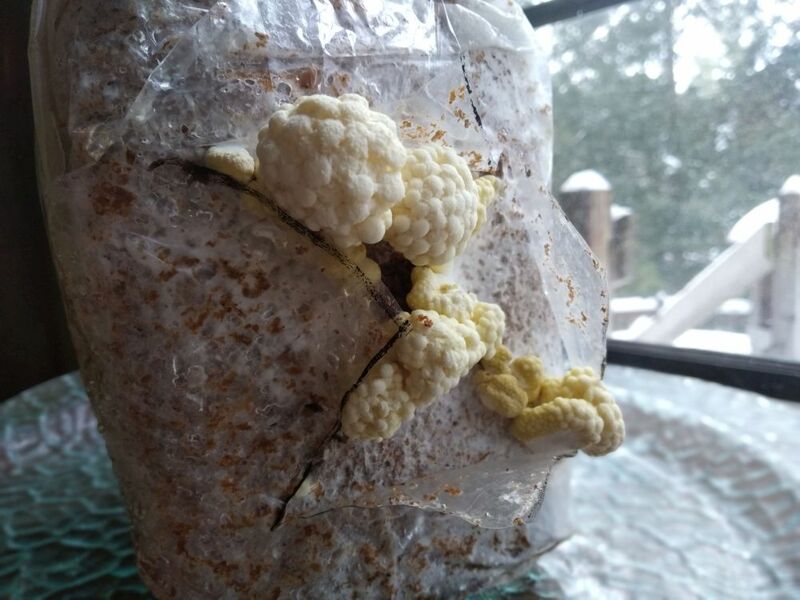 I had the same problem with my lion's looking more like cauliflower, the person who gifted the culture said to lower the temps, which worked and made them look more normal. It is very hard to get that toothy look like in nature. Taste is not affected regarding how they look though. Your oysters need more humidity, and your lion need less. They look awesome tho.. Just a matter of dialing them in. If you don't have plans for selling them, it is not that important.